This 10-track album was written by Pål Waaktaar, except "Move To Memphis" by Pål and Magne Furuholmen and "Lamb To The Slaughter" by Magne. The album was produced by David Z and a-ha and mixed by Rod Hui with Pål Waaktaar. It features Morten on vocals, Magne on keyboards, Pål on guitar, J.B. Bøgeberg on bass, Per Hillestad on drums and JD Steele, Jevetta Steele and Kathy Wilson on backing vocals on "Lie Down In Darkness" and "Move To Memphis". This German made album was available in many European countries. The cover of the LP features a large red and orange a-ha-logo which appears to be glowing through the undergrowth. Underneath there is a colour-shot by Just Loomis of a-ha standing on a beach (Pål, Morten and Magne). The title is written in small white letters at the top. The reverse of the LP features more of the red and black 'undergrowth' with a black and white shot of the band in the bottom section (Magne, Morten and Paul - similar to that on "The Blood That Moves The Body '92" single). The tracks are listed in white above the picture. It comes with an inner sheet with a large black and white a-ha picture and the lyrics on the back. The LP version of the album was not available in the UK but could be imported from Germany. The CD edition has similar cover to the LP. It comes with an 8-page booklet. The pages of this booklet have a grey and black patterned background design. Inside the cover there is a photograph of a woman lying on a bed and the track listing is written in white on the facing page. In the centre there is a large black and white band-shot (Magne, Morten and Pål). The other pages feature the lyrics in white text and other black and white group shots. Early pressings of the CD booklet have the lyrics for "Memorial Beach" missing, although they are present in later pressings. The reverse of the booklet has a picture of a red and orange locust `glowing' through the undergrowth. The back insert has a different colour-shot of a-ha standing on the beach. The tracks are written in white on a black background underneath and "Produced by David Z and a-ha" printed in red. The CD is grey with a picture of a locust in white at the bottom and other text in white. The matrix code of this release is: 936245229-2. There were at least two further pressings of the CD album. The second pressing is printed using a slightly lighter shade of charcoal than the first and the matrix code, printed around the centre of the disc is: 936245229-2.2 V01. The third pressing is printed in much darker, almost black shaded of grey and the matrix number is 936245229-2.3 V01. The German made cassette has a similar cover to the LP and CD. The sleeve folds out with the song lyrics printed in black over the top of a very pale undergrowth shot on one side. The other side features the black and white group shot found in the centre of the CD booklet, a glowing red and yellow locust with text in white printed over the top plus the black and white picture of the woman lying on the bed with track listing in white above. 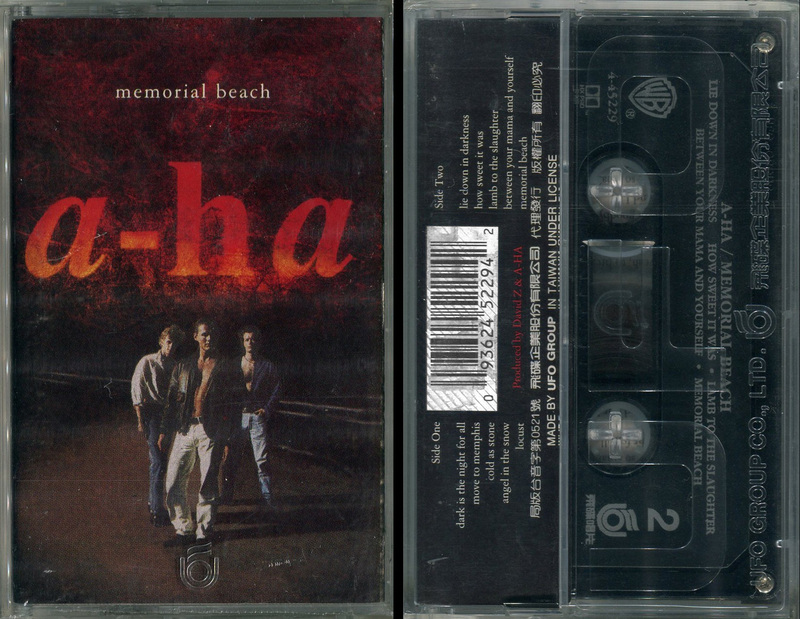 The spine of the cassette sleeve is black with white text, it displays the title "a-ha memorial beach" landscaped in the centre with the Catalogue number 9362-45229-4(U) WE 491 oriented at the top and the "WB" logo at the bottom. The back sleeve also comes with a black background with white text, the track listing for each side is displayed down the left and right hand sides, separated with a white barcode in the centre. There is some red text printed under the barcode which reads; "Produced by David Z & A-HA". Along the bottom, it shows some additional Manufacturing information again in white; "Made in Germany by WARNER MUSIC MANUFACTURING EUROPE". The "LC 0392" coding is also included at the bottom right hand corner. 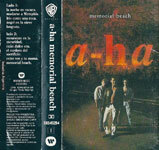 The actual cassette is transparent / grey with white titles; it displays the title "a-ha/MEMORIAL BEACH" along the top with the track listing to each side underneath. The "WB" logo, Catalogue number 9362-45229-4 and "GEMA/BIEM" logo are shown and the left, with side 1 or 2, "120µs" symbol and "DOLBY HX-pro B-NR" on the right. Along the bottom of side 1, there is some Copyright and manufacturing information; "All rights of the producer and of the owner of the work reproduced reserved. Unauthorized copying, hiring, public performance and broadcasting of this recording prohibited. Made in Germany by WARNER MUSIC MFG EUROPE, A TIME WARNER COMPANY". At the bottom of side 2, it displays instead some Production text; "PRODUCED BY DAVID Z & a-ha. (P) 1993 Warner Bros. Records Inc. for the U.S. & WEA International Inc. for the world outside of the U.S."
Tracks: Dark Is The Night For All (3:46) / Move To Memphis (4:22) / Cold As Stone (8:19) / Angel In The Snow (4:13) / Locust (5:09) // Lie Down In Darkness (4:32) / How Sweet It Was (6:00) / Lamb To The Slaughter (4:20) / Between Your Mama And Yourself (4:16) / Memorial Beach (4:36). There is a WEA records promo "TapetoTape" cassette which comes with a white paper insert. The "TapetoTape" logo is printed in black at the top with the tracks listed below. It has the same track listing as the regular release. Lado 2: recuestate en la oscuridad / cuan dulce era / el cordero del sacrificio / entre vos y tu mama / memorial beach Unlike the European edition, there is no barcode shown on the back cover, an additional "WARNER MUSIC ARGENTINA" logo has been displayed in the centre under the track listing and includes the Spanish text; "Una compania del Grupo Time Warner". At the bottom of the back sleeve, there is some other Spanish Production, Copyright and Dolby information which reads; "Prohibida la reproduccion, locacion y prestamo de este ejemplar y suy radiodifusion o ejecucion publica. Rreservados todos los derechos de los autores de las obras y del p oductor de fonogramas. INDUSTRIA ARGENTINA – MARCAS REGISTRADAS SADAIC-BIEM-AADI-CAPIF Este cinta fue grabada con la caracteristica Dolby Tipo B de reduccion de ruido. Durante la reproduccion de la misma colocar el selector de Dolby NR del grabador en la posicion ON. De no contra con esa posibilidad, ajustar convenientemente el control de agudos". The spine is black with white text and the title is displayed much larger than on the European release. The "WB Records" logo is shown orientated at the top with the "Dolby System" symbol, Catalogue number 9362-45229-4, Square "Number 1" symbol and "Warner Music" logo at the bottom. The inside of the insert is similar to the European release which includes the full track lyrics printed on one side, but the background colour is more charcoal than the usual lighter grey. The usual "Warner Bros Records Inc." Production and Copyright information at the bottom right hand corner has been over-dubbed with a white text box and displays instead some Spanish Production text in black; "℗ 1993 Warner Bros Records Inc. para los Estados Unidos y WEA International Inc. para el resto del mundo". The reverse features the regular black and white group shot, glowing red and yellow locust with the white text printed over the top, and the picture of the woman lying on the bed with track listing in white above. The background colour on this has been printed in brown instead of the usual black. The cassette itself is transparent with grey text which is again printed in a larger font. The title "A-HA MEMORIAL BEACH" is shown along the top with all of the tracks to each side listed in Spanish underneath. On the left hand side, it displays the catalogue number 9362-45229-4 and "WB Records" logo, with Side "A" or "B" and "INDUSTRIA ARGENTINA" included on the right hand side. Along the bottom of both sides, there is some Spanish Copyright Information shown in the centre which reads; "Prohibida la reproduccion, locacion y prestamo de este ejemplar y su radiodifusion o ejecucion publica. Reservados todos los derechos de los autores de las obras y del productor de fonogramas". Also included at the bottom left hand corner is the "WARNER MUSIC ARGENTINA" logo with "SADAIC-BIEM AADI-CAPIF" shown at the bottom right. The CD release comes with the regular front and back cover artworks. On the back sleeve, the barcode is smaller compared to the European release and shows the catalogue number 9362452292 underneath without any dashes. Along the bottom, it displays the regular "Warner Bros. Records Inc." contact address with some additional Australian manufacturing information; "Warner Bros. Records Inc., a Time Warner Company. 3300 Warner Blvd., Burbank, CA 91505-4694. 75 Rockefeller Plaza, New York, NY 10019-6908. © ℗ 1993 Warner Bros. Records Inc. for the U.S. and WEA International Inc. for the world outside of the U.S. All Rights Reserved. Unauthorized duplication is a violation of applicable laws. Manufactured and Distributed by Warner Music Australasia". The disc is black with white text and displays the regular picture of the locust at the bottom. 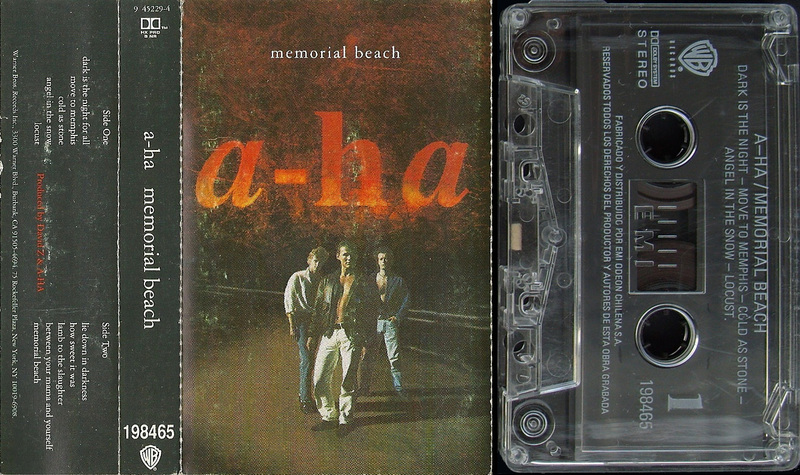 The title "a-ha memorial beach" is shown on the left hand side with the catalogue number 936245229-2, "WB", "COMPACT disc DIGITAL AUDIO" and "DIGITAL AUDIO TECHNOLOGIES AUSTRALIA" logos on the right, it also includes the text; "© ℗ 1993 Warner Bros. Records Inc. A Time Warner Company". Around the outer edge of the disc is some copyright and manufacturing information; "ALL RIGHTS OF THE MANUFACTURER AND OF THE OWNER OF THE RECORDED WORK RESERVED. UNAUTHORIZED COPYING, HIRING, LENDING, PUBLIC PERFORMANCE, BROADCASTING OF THIS DISC PROHIBITED. MANUFACTURED AND DISTRIBUTED BY WARNER MUSIC AUSTRALASIA". The regular charcoal inner lyric booklet is included and displays the Australian catalogue number on the back page. The Brazilian LP release of "Memorial Beach" was manufactured and distributed by "BMG ARIOLA DISCOS LTDA.". The release comes with the same front cover as the German made edition, but includes the Brazilian Catalogue number 670.8309 printed in white at the top right-hand corner of the front sleeve. On the reverse of the sleeve, the regular layout is shown featuring the red and black undergrowth with the full track listing printed in white and black and white shot of the band members similar to that taken from the 1992 single "The Blood That Moves The Body 92" located at the lower half of the sleeve. There is no barcode included in the top right-hand corner, but the European Catalogue number 936245229-1 is additional shown (again in white) and printed very small in the top left. Along the bottom of the back sleeve, there is some Brazilian manufacturing and distributing information displayed in Portuguese; "℗ 1993 WARNER BROS RECORDS INC. WARNER MUSIC BRASIL LTDA – C.G.C. 42.470.112/0001-56 – FABRICADO E DISTRIBUIDO POR BMG ARIOLA DISCOS LTDA. - C.G.C. 56.697.162/0002-66 – SCDPDPF 50/87 - INDUSTRIA BRASILEIRA". The "WARNER MUSIC BRASIL" logo is additionally included at the bottom left-hand corner with the regular "WB" logo located at the bottom right. The record itself comes with cream lined labels and black printed text. 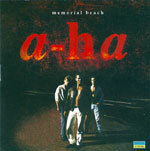 The usual colour "WB RECORDS" logo is located at the top with the title "MEMORIAL BEACH" and A-HA underneath. On the left-hand side, there is some coding; "C.G.C. 56.697.162/0002-66" displayed within a small rectangular box. The Catalogue number and side reference "670.8309-A" or "670.8309-B" is instead shown on the right-hand side. At the lower half of each side is the full track listing with each track containing an 8-digit reference number. The track credits and track lengths are also present. There is some other production text printed in bold and reads the same on both sides; "Produced by David Z & A-Ha (P) 1993 Warner Bros. Records Inc.". Around the bottom half of the outer rim is some manufacturing and distributing information which is similar to that shown on the back sleeve, it also contains the record company contact address; "Fabricado e distribuido por BMG ARIOLA DISCOS LTDA – Divisdo SONOPRESS – Av. Eng. Billings, 2227 – C.G.C. 56.697.162/0002-66 – SP – Todas os direitos reservados Ind. Brasileira – WEA DISCOS LTDA. Rua – Itaipava, 44 – Jardim Botanico – Rio de Janeiro – RJ – C.G.C. 42.470.112/0001-56 – Censura Pratocolo Geral nº 273". The album also comes with a charcoal double-sided sheet (rather than an inner sleeve) displaying the regular layout. The full track lyrics are included on one side, with the regular black and white shots of the three band members faces and full album credits on the other. At the top right-hand side of the lyrics side, it displays the European Catalogue number 936245229-1, whilst at the top right-hand side of the picture and credits side, it instead shows the Brazilian Catalogue number 670.8309. The Brazilian CD release of the album was manufactured by "Microservice" and is similar to the European edition, but comes with a black disc with silver text. The tracks are listed in silver down the centre of the disc (above and below the centre hole). 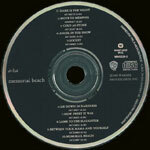 The title "a-ha memorial beach" is printed on the left hand side of the disc with the "WARNER MUSIC BRASIL" record company and "COMPACT disc DIGITAL AUDIO" logos on the right, some production text; "℗ 1993 WARNER BROS RECORDS INC." is also included. There is also some Brazilian manufacturing information; "FABRICADO PELA MICROSERVICE – C.G.C. 34.525.444/0001-62 – INDUSTRIA BRASILERA" printed around the outer rim of the disc on the right hand side. The inside booklet is similar to the European second pressing and is coloured charcoal; it additionally includes the page numbers and Brazilian catalogue number M945229-2 on the back cover. On the back sleeve, there is no barcode or catalogue number shown in the top right hand corner. The usual artwork is shown and displays the track listing again in white underneath. On the left hand side, it includes the additional text; "℗ 1993 WARNER MUSIC BROS RECORDS INC" in red plus some Brazil production and distribution information; "WARNER MUSIC BRASIL LTDA – C.G.C. 42.470.112/0001-56-PRODUZIDO PELA MICROSERVICE – MICROFILMAGENS E REPRODUCOES TECNICAS DA AMAZONIA LTDA., NA ZONA FRANCA DE MANAUS – C.G.C. 34.525.444/0001-62 DISTRIBUIDO PELA BMG ARIOLA DISCOS LTDA. – C.G.C. 56.697.162/0002-66 SCDPDPF 50/87 – INDUSTRIA BRASILEIRA." along the bottom in white. The "WARNER MUSIC BRASIL" and "COMPACT disc DIGITAL AUDIO" logos are again shown. There is also a gold stamped issue of the "Microservice" pressing which was used for promotional purposes and comes with a circular gold "AMOSTRA BMG INVENDAVEL" stamp on the back sleeve. The Brazilian cassette was manufactured and distributed by "BMG ARIOLA DISCOS LTDA" under license to "WARNER MUSIC BRASIL LTDA". The front cover comes with the same artworks as the European edition but the layout and design of the spine and back cover is different. The back cover has a black background with white printed text, and displays the full track listing landscaped in uppercase lettering, with the European catalogue number 936245229-4 shown orientated at the top. 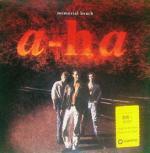 The spine is also black with white text, and comes with the title "A-HA MEMORIAL BEACH" displayed landscaped in the centre; with the "WARNER MUSIC BRASIL" logo included on the left hand side. The catalogue numbers for the "LP-670.8309", "MC-767.8309" and "CD-M945229-2" releases are again shown landscaped on the right hand side and include the "Dolby-b" text. The "DOLBY SYSTEM" logo is also additionally shown, but printed orientated at the bottom. The insert folds out to display the regular full track lyrics on one side and the black and white group shot, glowing red and yellow locust with credits in white and the black and white picture of the woman lying on the bed with track listing in white above on the other side. The usual "Warner Bros. Records Inc." contact details have been omitted. The tape is transparent / grey with white titles and displays the full track listing to each side at the top with the "WARNER MUSIC" logo coloured black, in-between the cogs, there is some Brazilian record company information shown at the bottom of side 1, it reads; "WARNER MUSIC BRASIL LTDA - Rua Marquis de Sao Vicente, 99-4º andar-Rio de Janeiro-RJ CGC42470112/0001-56 SCDP-SR/GB/DPE273/76". On side 2 there is instead some Brazilian Manufacturing and Distributing information displayed at the bottom which reads "Fabricado e Distribuido por BMG ARIOLA DISCOS LTDA. Av Eng. Billings, 2227 - Sao. Paulo – CGC 56.697.162/0002-66 – SCDP DPF – 50/87 – S. Paulo – Industria Brasileira - Sob Licenca de WARNER MUSIC BRASIL LTDA". The usual "WB" logo, "Dolby-B" symbol and catalogue number 767.8309 are also shown. The Canadian CD, released 14 June 1993, of "Memorial Beach" is similar to the second European pressing with a more charcoal coloured lyric booklet. The disc is black with a white locust, rather than grey with grey and white. There is no manufacturing or copyright information around the outer edge of the disc; instead there is some distributing information printed on the left hand side; "DISTRIBUTED BY/DISTRIBUE PAR WARNER MUSIC CANADA LTD 1810 BIRCHMOUNT RD., SCARBOROUGH, ONTARIO M1P 2J1 A TIME WARNER COMPANY. ALL RIGHTS RESERVED". The "WB", "COMPACT disc DIGITAL AUDIO" logos and catalogue number CDW 45229 are shown on the right, along with some text; "© (P) 1993 Warner Bros. Records Inc., a Time Warner Company. The barcode on the back sleeve is smaller than on the European pressing and without catalogue number underneath. Along the bottom of the back sleeve is some distributing and copyright information similar to that printed on the disc; "© ℗ 1993 WARNER BROS. RECORDS INC. FOR THE UNITED STATES AND WEA INTERNATIONAL INC. FOR THE WORLD OUTSIDE OF THE UNITED STATES DISTRIBUTED BY/DISTRIBUE PAR WARNER MUSIC CANADA LTD. 1810 BIRCHMOUNT RD., SCARBOROUGH, ONTARIO M1P 2J1 A TIME WARNER COMPANY. ALL RIGHTS RESERVED. UNAUTHORIZED REPRODUCTION OF THIS RECORDING IS PROHIBITED BY LAW AND SUBJECT TO CRIMINAL PROSECUTION". The usual "WB" and "COMPACT disc DIGITAL AUDIO" logos are included. The album comes with the regular charcoal lyric booklet but the catalogue number is printed on the inside back page rather than on the back cover itself. The Chilean cassette comes with the usual front cover artworks similar to the US release but the spine and back sleeve is coloured dark brown rather than black. The back sleeve also comes without the barcode and displays the track listing for side 1 down the left hand side and side 2 down the right hand side. The usual red text; "Produced by David Z & A-HA" is included in the centre. Along the bottom printed in white is the regular record company information; "Warner Bros. Records Inc., 3300 Warner Blvd., Burbank, CA 91505-4694. 75 Rockefeller Plaza, New York, NY 10019-6908". On the spine, the title "a-ha memorial beach" is displayed landscaped in the centre, with the US catalogue number 9 45229-4 and "DOLBY HX PRO B NR" logo shown orientated at the top and the Chilean catalogue number 198465 and "WB" logo at the bottom. The inside of the insert folds out to include the regular track lyrics on one side and artworks on the other. The usual record company and copyright information is shown, along with some additional "Dolby" text; "Warner Bros. Records Inc., a Time Warner Company © ℗ 1993 Warner Bros. Records Inc. for the U.S. and WEA International Inc. for the world outside of the U.S. Made in U.S.A. All Rights Reserved. Unauthorized duplication is a violation of applicable laws. Dolby, the double-D symbol and HX PRO are trademarks of Dolby Laboratories Licensing Corporation". The tape is transparent clear with a grey centre piece and white text. The title "A-HA / MEMORIAL BEACH" is displayed at the top with the full track listing to each side underneath. On the left hand side, it includes the "WB Records", "DOLBY SYSTEM" and "STEREO" logos, with Side 1/2 and the Chilean catalogue number shown on the right. Along the bottom of side 1 there is some Spanish manufacturing and distributing text; "FABRICADO Y DISTRIBUIDO POR EMI ODEON CHILENA S.A. RESERVADOS TODOS LOS DERECHOS DEL PRODUCTOR Y AUTORES DE ESTE OBRA GRABADA". Whilst along the bottom of side 2, it displays instead some Spanish production information; "(P) 1993 WARNER BROS. RECORDS INC. PROHIBIDA SU REGRABACION Y SU UTILIZACION PARA LA EJECUCION PUBLICA Y/O RADIODIFUSION". The cassette is similar to the European edition but was released by "Croatia Records". The tape is black with yellow stickered labels and black text. The title "A-HA/MEMORIAL BEACH" is displayed at the top with the track listing to each side underneath. The "WB" and "CROATIA RECORDS" logos are shown on the left hand side along with the catalogue number MC-7-S 3042510 and "BIEM-HDS". On the right hand side of side 1, it displays some Croatian copyright information; "Sva prava porizvodaca I viasnika snimijenog dijela pridrzana Zabranjuje se javno izvodenje, presnimavanje I radiodifuzija ove snimke." and along the bottom, there is some production text; "PRODUCED BY DAVID Z & A-HA". At the bottom right hand corner of side 2, it instead has the "Dolby HX PRO B NH" symbol, plus some other different production text along the bottom; "(P) 1993 Warner Bros. Records Inc., a Time Warner Company". The release comes with the usual fold-out insert displaying the full track lyrics and regular artworks. On the spine, the "CROATIA RECORDS" logo is additionally shown at the top along with the catalogue number MC-7-S 3042510. The back sleeve comes with a different barcode number "3 850123 042510" compared to the European release and includes some additional editor credit information which reads; "Urednik redakcije: VELJKO DESPOT Glavni I odgovorni urednik: SINISA SKARICA". There exists a Czech Republic CD of "Memorial Beach" which was distributed by POPRON and licensed by Warner Bros. "Popron" is printed in white letters in the bottom right hand corner of the back sleeve. Otherwise the sleeve design is similar to the European release. The code 50 233-2 is printed underneath poprun on the disc. There is a slightly different pressing of "Memorial Beach" in Germany known as the "Club Edition" which comes with the regular European artworks and disc, but displays a different number 799403 on the barcode on the reverse of the sleeve. This additional number also comes as part of the Catalogue number 79 940 3 9362-45229-2 WE 833 and has also been printed on the back of the CD booklet, top of the actual spine (in red) and on the back sleeve under the barcode. There is also a German Club Cassette edition of "Memorial Beach" which is virtually the same as the German regular release, but the barcode number on the back sleeve comes instead with a different number 747113. The Catalogue number shown at the top of the spine also includes the additional number; 74 711 3 9362-45229-4Ⓤ WE 491. The fold-out insert and actual tape are otherwise the same. There was also a unique promo only item available in Germany. It consists of the standard album "Headlines And Deadlines", the standard "Dark Is The Night" German single plus 11 special paper inserts (all 1 sided except no. 4 - see below) and the Headlines and Deadlines album booklet. These inserts come in the pockets of a black a-ha CD carry case. 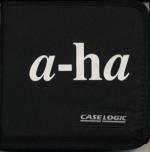 The a-ha logo is printed in white letters on the front of the case with "Case Logic" in white embroided letters at the bottom. Slight variations on this promo item exist with slightly different paper inserts plus three framed Diascope slides and 1 large photo negative slides. Some of the 11 paper inserts also differ slightly. The Indonesian cassette is similar to the U.S made release but includes the text "Hanya Untuk Dijual Di Indonesia" printed in white at the bottom of the front sleeve. The insert folds-out to reveal the song lyrics and usual artwork. There is some additional Indonesian manufacturing and copyright information displayed at the bottom right hand corner of the lyric side which reads; "Manufactured in Indonesia under licence from Warner Bros. Rec.Inc./WEA International Inc. No licence is granted or is to be implied by the sale or supply of this cassette or container there of under or in relation to any trademark of copyright of or owned by Warner Bros. Rec. Inc./WEA International Inc. anywhere in the world outside Indonesia". On the spine, the regular U.S catalogue number 9 45229-4 is displayed at the top in red, along with an additional number W0303. The usual barcode and full track listing is included on the back sleeve, plus there is some additional Trade mark information; "Trade mark and recording licensed to PT. Aquarius Musikindo for manufacture and sale in Indonesia only". Some copies also come with an official "LUNAS P P N" blue, green and yellow leafed sticker. 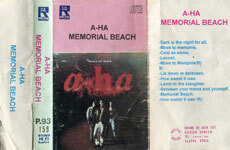 The tape is clear transparent with a grey centre piece and white printed text, the title; "A-HA MEMORIAL BEACH" is displayed at the top with the track listing to each side underneath. The "WB Records" logo is included on the left and the full European Catalogue number 9362 45229-4, "STEREO" and side 1/2 is on the right. Some production and copyright information is displayed at the bottom of both sides; "℗ & © 1993 WARNER BROS.RECORDS INC. FOR THE U.S AND WEA INTERNATIONAL INC. FOR THE WORLD OUTSIDE OF THE U.S. ALL RIGHTS OF THE MANUFACTURER AND OF THE OWNER OF THE RECORDED WORK RESERVED AND UNAUTHORISED PUBLIC PERMORANCE, BROAD CASTING OR COPYING OF THIS RECORDING IS PROHIBITED". The cassette album from Israel comes with the regular European folded insert. The cassette itself is white with pinky/red text. On Side 1, at the top centre, is "A-HA/ MEMORIAL BEACH" in capitals, then the Track listing underneath reads:- "DARK IS THE NIGHT / MOVE TO MEMPHIS / COLD AS STONE / ANGEL IN THE SNOW / LOCUST". On the left hand side is a large "WB" logo and Catalogue Number "945229". On the right hand side is a large "1" plus Side 1 in Hebrew and "ACUM". At the bottom centre is some copyright and manufacturing information: "ALL RIGHTS OF THE OWNER AND OF THE PRODUCER OF THE RECORDED WORK ARE RESERVED. UNAUTHORISED COPYING, PUBLIC PERFORMANCE, BROADCASTING, HIRING OR RENTAL OF THIS RECORDING ID PROHIBITED. (P) 1993 HED ARZI (1973) LTD. (C) 1993 HED ARZI 1973 LTD. MADE IN ISRAEL". At the bottom right hand corner of side 1, there is some Hebrew text. On side 2, the title is again in capitals with the track listing underneath: "LIE DOWN IN DARKNESS / HOW SWEET IT WAS / LAMB TO THE SLAUGHTER / BETWEEN YOUR MAMA AND YOURSELF / MEMORIAL BEACH". The WB logo, catalogue number and other info is also printed on side 2 plus some Hebrew text, likely to be a translation of the copyright information from side 1. The CD comes with a Japanese lyric sheet plus a white and red obi strip with red, blue, white and yellow text. As with the early pressings of the European release, the lyrics for the title track are also missing from the booklet. The album title is printed in English on one of the spines and in Japanese on the other. 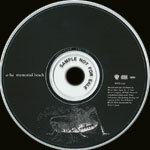 On the promo copy of the CD album, the text "sample not for sale" is etched in around the centre of the disc and a white and red promo-sticker is on the back insert. The Korean CD comes with the regular front cover artworks but the layout of the back sleeve and spine is slightly different. There is no barcode or catalogue number displayed on the back sleeve and all of the track listing is shown with a different font and in uppercase lettering, the track lengths are also included. Along the bottom, the "WB" and "WARNER MUSIC KOREA" logos are also shown along with some manufacturing and distributing information; "Distributed by WARNER MUSIC KOREA LTD. A Time Warner Company. Manufactured by Sam Sung Electronics in cooperation with HWA EUM Record Co. LTD., Printed in Korea (’93.6.12)9305-L16672-L16686 Ⓓ93-1715(93.6.7)". The spine is black with all of the text shown in white. The title "A-Ha/memorial beach" is displayed as usual landscaped in the centre, but again printed in a different font. The catalogue number 9362-45229-2 is shown on the left with "Warner Bros" on the right. The disc is silver rather than the usual black and includes the image of the locust at the bottom. The "WARNER MUSIC KOREA" logo is shown on the right hand side, plus some copyright text and manufacturing information around the outer rim of the disc; "ALL RIGHTS OF THE PRODUCER AND OF THE OWNER OF THE WORK REPRODUCED RESERVED. UNAUTHORIZED COPYING, HIRING, LENDING, PUBLIC PERFORMANCE AND BROADCASTING OF THIS RECORD PROHIBITED. MANUFACTURED by Sam Sung Electrinics in COOPERATION WITH HWA EUM RECORD LTD., (’93.6.7)9305-L16180-L16184 Ⓓ 93-1695 (93.6.4)". The disc also states that it was "produced by Patrick Leonard". The insert booklet is light grey, rather than dark grey and doesn't include the centre band shot. The last two pages include some Korean text, rather than the usual credits page. The LP has similar front sleeve to the European release. The back of the sleeve is similar to the back insert of the European CD release, featuring a colour shot of the band standing on a beach with the track listing on a black background underneath. The tracks are listed in white capital letters with the track lengths printed afterwards, this differs from that used on the European CD On the front sleeve, there is a yellow sticker with some Korean lettering plus mention of Angel In The Snow and Dark Is The Night. The album comes with a picture insert. The Korean cassette comes with a pinkish front cover displaying a smaller picture of the regular album artworks at the top half of the sleeve. 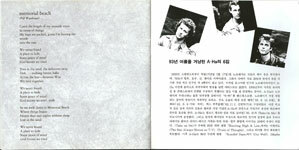 The insert folds out with the entire track lyrics on one side shown on a white and grey patterned background, The other side is light pink/purple with some black Korean text displaying some history about the band and the single releases, there is also a pink/white shot of the band (Magne, Morten, Paul) included. The spine is white and displays the title in pink, with the a-ha logo printed in Korean. There is a black "WB" logo at the top and the "Warner Music Europe" logo again in black at the bottom. The back sleeve is also white with black text and comes without a barcode. The track listing is displayed down the left hand side for side 1 and down the right hand side for side 2. The European catalogue number is displayed in the centre along with some copyright text; "Warning: All rights reserved. Unauthorized duplication is a violation of applicable laws". There is also some manufacturing and distributing information shown along the bottom; "Distributed by WARNER MUSIC KOREA LTD. A Time Warner Company. Manufactured by HWA EUM Record Ltd., Registration No. 275 to the Ministry of Culture Printed in Korea (93. 6. 12) 9305-L16672-L16686 (D)93-1715 (93. 6. 7)". The cassette is white with light grey stickered labels and dark blue text. The title "A-HA / MEMORIAL BEACH" is displayed at the top with the track listing to each side underneath. The "WARNER MUSIC KOREA" logo is shown on the left hand side, with side A or B on the right hand side. Along the bottom of each side is the same manufacturing information; "MANUFACTURED BY HWA EUM RECORDS LTD., MINISTRY OF CULTURE REGISTRATION NO. 275". The cassette additionally comes in a dark tinted cassette case. The Malaysian cassette is similar to the US release; the tape is clear with a grey centre piece but comes instead with blue cogs rather than the standard black ones. There are no "Dolby HX PRO B NR" or "SR" symbols included and the US production text; "a Time Warner Company. Made in U.S.A." has been omitted. The catalogue number is also the same 4-45229. The front of the cassette case comes with an additional Silver "TULEN KPDN & HEP ORIGINAL" compact disc/film strip hologram sticker. On the reverse, there is a small white sticker with black text displaying a Malaysian record company address; "EDARAN WARNER MUSIC (MALAYSIA) SDN BHD 9TH FLOOR, MUI PLAZA, JALAN P. RAMLEE, 50250 KUALA LUMPUR, BUATAN MALAYSIA". The usual lyric fold-out insert is included showing the regular front and back cover artworks but again there is no Dolby symbol shown on the spine. The same US catalogue number 9 45229-4 is used and shown at the top, with the "WB" logo at the bottom. On the inside of the insert at the bottom right hand corner of the lyric side, the regular "Dolby" information has been overdubbed with the text; PRINTED BY DIGITPRESS. The Mexican cassette comes with the usual fold-out insert displaying the regular front and back cover artworks. Sealed copies additionally come with an additional blue "amprofon DI NO A LA PIRATERIA" anti-piracy printed on the cellophane. The back sleeve comes with a white barcode but the number "0 93624 52294 2" has been set out slightly differently compared to the European edition. The track listing for each side is displayed as usual down the left and right hand sides. Along the bottom underneath the text; "℗ © WARNER BROS. RECORDS INC.", there is some Spanish manufacturing and record company contact information; "Hecho en Mexico por WARNER MUSIC MEXICO, S.A. DE CV Acapulco No. 37 Mexico. 06140 Tel. 553 66 88. A TIME WARNER COMPANY MARCAS REGISTRADAS • PARA SU VENTA EN MEXICO". On the spine, the title "a-ha memorial beach" is displayed landscaped in the centre with the Mexican catalogue number CPXB-7340 and "Dolby HX PRO B NR" logo shown orientated at the top, and the "002" looking symbol and "WB" logo at the bottom. 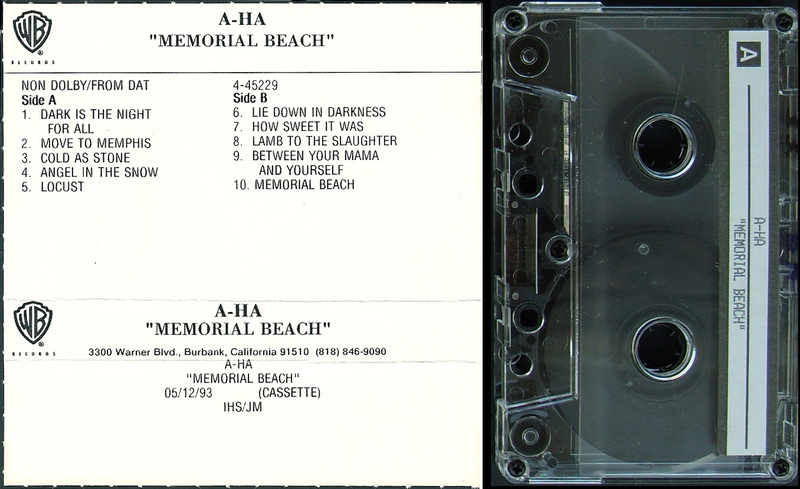 The tape is transparent/grey with white text and includes the title "A-HA/MEMORIAL BEACH" at the top with the track listing to each side shown underneath. The "WB" logo is displayed on the left hand side with the catalogue number CPXB 7340 and side 1/2 on the right hand side. At the bottom of side 1, there is some Spanish Production information; "(P) 1993 WARNER BROS. RECORDS INC. UNA COMPANIA DE TIME WARNER COMPANY HECHO EN MEXICO" and on side 2, there is some Spanish Copyright text; "(C) 1993 WARNER BROS> RECORDS INC EL IMPORTE PAGADO POR ESTE FONOGRAMA NO AUTORIZA SU EJECUCION PUBLICA CON FINES DE LUCRO". 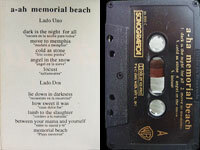 The cassette release from Peru looks unofficial, it comes with a single sided folded insert with the regular cover artwork printed in colour and displayed in the centre of the front sleeve, the remainder is in plain white with the title "MEMORIAL BEACH A-HA" in black uppercase lettering along the top and some Manufacturing information; "FABRICADO POR “EL VIRREY” INDUSTRIAS MUSICALES S.A. R.I. 12428" at the bottom. The spine is also plain white with the title printed landscaped and in red. The "WB RECORDS" logo is displayed oriented at the top in black with the Catalogue number MC-WBR 452294 and "STEREO" shown at the bottom. The full track listing is included on the fold-out part in both Spanish and English, along with track credits and track lengths. On the back sleeve which comes instead with a light blue background and black text, there is a picture of a cassette tape with crossbones shown underneath the track listing displaying some Spanish Copyright Warning information; "ADVERTENCIA Estos fonogramas estan protegidos en favor de su productor conforme a Ley. Prohibido el alquiler, reproduccion y comunicacion publica sin la autorizacion escrita de su productor fonografico. Toda violacion esta penada por los articulos 216 y siguientes del Codigo Penal. La adquisicion de este ejemplar no faculta su explotacion". The tape is clear transparent with patterned lines and white printed text, the title and "WB RECORDS" logo is displayed along the top with the Catalogue number MC-WBR 452294 at the bottom, there is also some Spanish Copyright and Manufacturing information which reads; "QUEDAN RESERVADOS TODOS LOS DWEECHOS DEL AUTOR Y DEL PRODUCTOR DE FONOGRAMAS ESTA PROHIBIDA LA COPIA. LOCACION Y EJECUCION PUBLICA DE ESTE FONOGRAMA. MANUFACTURADO POR "EL VIRREY" INDUSTRIAS MUSICALES S.A. - INDUSTRIA PERUANA - R.I. 12428". The Philippine cassette release comes with the same front and back cover artworks as the US edition but doesn’t include a barcode on the back sleeve. The usual track listing for side 1 is printed in white down the left hand side with the track listing for side 2 shown down the right hand side. The regular red Production text; "Produced by David Z & A-HA" is included in the centre. There is also some Philippine manufacturing and distributing text shown in white along the bottom; "Manufactured and Distributed by Warner Music Philippines, a Time Warner Company". 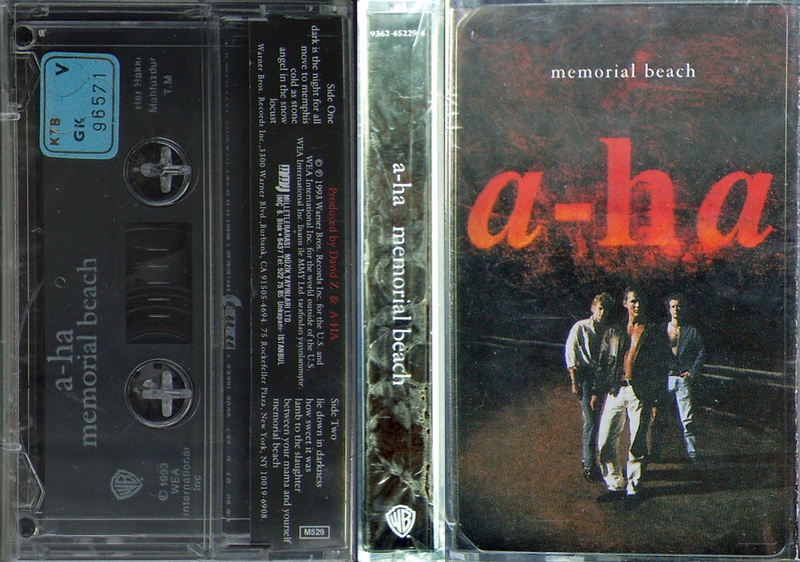 On the spine, the title "a-ha memorial beach" is printed in white and displayed landscaped in the centre with the standard U.S catalogue number 9 45229-4 and "Dolby HX PRO B NR" symbol shown orientated at the top and "WB" logo at the bottom. The regular fold-out insert is included displaying the full track lyrics on one side and the artworks on the other. The tape itself is clear transparent with a white stickered label and black text. The title "A-HA/MEMORIAL BEACH" is displayed along the top with the track listing to each side. The "WB" logo and catalogue number 4-45229 is additionally shown. The Polish cassette release was Manufactured by "POLTON" in Poland and uses the Catalogue number PCW-537. The front and back cover on the folded insert is virtually the same as the European release displaying the usual album artworks, but comes with an additional Silver CD/Cassette "ZPAV" hologram sticker in the bottom right hand corner. The Catalogue number at the top of the spine includes the word "POLTON" and comes with a musical note symbol in the shape of a swirl. On the back cover below the barcode it additionally has printed in white "Manufactured in Poland by POLTON". The tape itself is transparent clear and comes with a grey centre piece; the layout is different compared to the European release. At the top, it displays the title "a-ha / MEMORIAL BEACH" along with the track listing to each side underneath. On the left hand side we have the word ‘POLTON’ along with the musical note swirl symbol and Catalogue number. On the right hand side it displays an A or B instead of the usual side 1 or 2 and includes the "STEREO" and "ZAIKS" logos. Along the bottom of Side A it displays some Copyright information; "All rights of the producer and of the owner of the work reproduced reserved!. Unauthorised copying, hiring, public performance and broadcasting of this recording prohibited". On Side B, along the bottom it shows that the tape was "Manufactured by POLTON in POLAND". "Memorial Beach" was re-issued in a card slipcase in 2003, click here for more details. The Russian made LP of "Memorial Beach" appears to be unofficial; it only contains nine of the ten tracks and omits "How Sweet It Was". 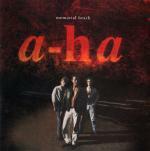 It comes with the regular front cover artworks displaying the title "memorial beach" along the top in white with the large red and orange a-ha-logo, which appears to be glowing through the undergrowth. The colour-shot by Just Loomis of a-ha standing on a beach (Pål, Morten and Magne) is also included. The artwork on the back sleeve is different with the glowing locust and track listing to each side displayed in white (and with a different font size layout) along the the top. There is no band shot at the bottom of the sleeve. The LP sleeve also does not contain any barcode, Catalogue number, record company logos or any other manufacturing information. 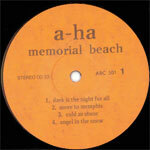 The record itself comes with plain orange labels with black printed text, a-ha and the title "memorial beach" is printed in lowercase lettering at the top. On the left hand side, it displays "STEREO OO 33" with the Catalogue number "ABC 501" and either Side "1" or Side "2" on the right. At the bottom of side 1, it lists four tracks; "dark is the night", "move to memphis", "cold as stone" and "angel in the snow", whilst at the bottom of side 2, it instead includes five tracks; "locust", "lie down in darkness", "lamb to the slaughter", "between your mama and yourself" and "memorial beach". Just like the sleeve, none of the labels include any further record company information as to whom or where the album was produced. The inside of the album also does not include the regular colour lyric sleeve, but instead comes with just a plain white sleeve. There is another Russian re-issue of "Memorial Beach" which was again released onto CD by "НИКИТИН". It features the same track listing as the earlier "НИКИТИН" slip-case edition and comes in a jewel case, it is similar to the European release displaying the regular front and back cover artworks, but includes an additional black obi-strip. The front of the obi displays a white "WARNER MUSIC" logo at the top with some white Russian text underneath about a-ha and this studio album release; "ЧЕТВЕРТЫЙ АЛЬБОМ НОРВЕЖЦЕВ A-HA СТАЛ ОДНИМ ИЗ САМЫХ НЕОДНОЗНАЧНЫХ В ИСТОРИИ ГРУППЫ. ОДНАКО ЖУРНАЛ "Q" ВКЛЮЧИЛ ЕГО В ТОП-50 АЛЬБОМ ГОДА, НАЗВАВ ПОЛА ВААКТАРА, ГИТАРИСТА И АВТОРА ПЕСЕН A-HA, ОДНИМ ИЗ ЛУЧШИХ КОМПОЗИТОРОВ СОВРЕМЕННОСТИ. ПЛАСТИНКА БЫЛА ПРОДАНА ТИРАЖОМ БОЛЕЕ 1 МЛН. 200 ТЫС. ПО ВСЕМУ МИРАУ. ИЗДДАНИЕ ВКЛЮЧАЕТ В СЕБЯ ХИТЫ "MOVE TO MEMPHIS", "ANGLE SHOW" И "DARK IS THE NIGHT FOR ALL", when translated it reads; "THE FOURTH ALBUM OF THE NORWEGIANS A-HA, BECAME ONE OF THE MOST IMPORTANT IN THE HISTORY OF THE GROUP. HOWEVER THE MAGAZINE "Q" INCLUDED IT IN THE TOP-50 ALBUM OF THE YEAR, NAMING THE FIELDS OF THE WAAKTAAR, THE GUITARIST AND THE AUTHOR OF A-HA SONGS, ONE OF THE BEST MODERN COMPOSERS. THE ALBUM WAS SOLD WITH A CIRCULATION OF MORE THAN 1 MILLION, 200 THOUSAND, WORLDWIDE. PUBLICATION INCLUDES HITS "MOVE TO MEMPHIS", "ANGLE SHOW" AND "DARK IS THE NIGHT FOR ALL". (The track "ANGEL IN THE SNOW" has been listed incorrectly as "ANGLE SHOW"). At the bottom of the obi, it contains the image of a Russian flag with the text; "FOR SALE IN RUSSIA", it also displays the "ФИРМА ГРАМЗАПИСИ НИКИТИН" logo. On the reverse of the obi, there is some Russian white text; "Также в продаже:" (Also on sale:), plus shots of the available albums "LIFELINES 4607173154330" and plain cover "STAY ON THESE ROADS 4607173157010" whilst at the bottom, the "ФИРМА ГРАМЗАПИСИ НИКИТИН" logo in the shape of a shield, white barcode "4607173 157041" and "www.fgnikitin.ru" website address are shown. The title "a-ha memorial beach" is centred in white on the spine with a red "Warner Bros 4607173157041" alongside, the "ФИРМА ГРАМЗАПИСИ НИКИТИН" logo is included on the left, with the Catalogue number 4607173157041 on the right. On the back sleeve, the regular English Production and Copyright information is shown which is similar to that on the earlier "НИКИТИН" slip-case edition;, but there is some other additional Russian "НИКИТИН" Record Company contact details, plus "Do not expose to mechanical or magnetic influences. Avoid direct sunlight and moisture" information included; "Warner Bros. Records Inc., a Time Warner Company. 3300 Warner Blvd., Burbank, CA 91505-4694. 75 Rockefeller Plaza, New York, NY 10019-6908. © ℗ 1993 Warner Bros. Records Inc. for the U.S. and WEA International Inc. for the world outside of the U.S. Unauthorized Copying, Hiring, Lending Of This Record Prohibited! Произведено в России. Издателы: ООО «Фирма грамзаписи «Никитин» по зксклюзивной лицензии «Warner Music». ВСЕ ПРАВА ЗАЩИЩЕНЫ. Адрес для направления предложений и претензий: «Фирма грамзаписи «Никитин», 105082, г.Москва, ул.М.Почтовая Д. 12, стр. 1,тел. : (495) 232-13-87, e-mail: [email protected], www.fgnikitin.ru Зксклюзивный дистрибьютор: «Торговая фирма «Никитин»: тел. : (495) 265-49-07, 265-49-18; e-mail: [email protected], www.tfnretail.ru Изготовитель (см. информацию на внутреннем кольце компакт-диска вокруг установочного отверстия): ООО «Уральский злектронный завод», 620137, г.Екатеринбург, ул.Студенческая, д.9, корп. 11а.Лицензия ВАФ 77-15 от 21.09.07 г. ООО «Линос» 117587, г.Москва Варшавское шоссе, д.125ж стр 1. Лицензия ВАФ № 77-238 от 03.02.2006г. Музыкальный компакт-диск формата CD-DA. ГОСТ 27667-88, ГОСТ 28376-89, ГОСТ Р 51121-97. Содержит музыкальную запись. Не подлежит обязательной сертификации. Не подвергать механическому или магнитному воздействию. Избегать попадания прямых солнечных лучей и влаги". The back sleeve also includes the "ФИРМА ГРАМЗАПИСИ НИКИТИН", "WB" and "COMPACT disc DIGITAL" logos and the same white barcode which appears on the obi-strip. The disc itself is coloured black and is similar to the European release displaying the title at the top and showing the regular artworks. Along the bottom, it again includes the "Никитин", "WARNER MUSIC" and "COMPACT disc DIGITAL AUDIO" logos in addition to the "wea" logo. Around the outer edge of the disc is some Russian and English Production and Copyright text which is similar to that printed on the back sleeve. The Catalogue number is 4607173157041. There is a Russian cassette album released by Никитин. it comes with a half sized fold-out sleeve with just the black and white shot of the woman on the bed with track listing plus the glowing locust and production text but no lyrics. The front cover is the same as the European edition but the back sleeve displays a slightly larger white barcode and doesn’t show the red "Produced by David Z & A-HA" text. The full track listing to each side is printed as usual down the left and right hand sides with a small additional "WB" logo included. Along the bottom there is some production and copyright information printed in English and Russian which reads; "Warner Bros. Records Inc., a Time Warner Company. © ℗ 1993 Warner Bros. Records Inc. for the U.S. and WEA International Inc. for the world outside of the U.S. ℗ 2003 фирма Грамзаписи НИКИТИН / www.records. All rights reserved. Email: [email protected] Тел./ф. : (095) 781-27-63. По вопросам приобретения обращаться "Торговая фирма НИКИТИН" по тел: МС-(095) 381-48-80, 381-66-05, CD - (095) 730-73-39, 730-73-40. E mail: [email protected]". The spine comes with the usual title a-ha memorial beach displayed landscaped in the centre with the catalogue number 9362-45229-4 HH-174MC/03 shown oriented at the top and the "WB" and "www records" logos at the bottom. The cassette is transparent clear with red and white cogs and white printed text. The title "a-ha memorial beach" is shown at the top with the track listing to each side underneath. At the top left hand corner we again have the "www.records.ru" website logo. The catalogue number and "WB" logo are displayed on the left hand side. Along the bottom of side A, there is some Russian "НИКИТИН" manufacturing and record company contact details; "℗ 2003 "фирма грамэаписи "НИКИТИН"/ www.records Торговая фирма "НИКИТИН" (095) 381-48-80, 381-66-05 Изготовитель ЗАО "СБС - рекордз". Лицеизия МПТР России ВАФ № 77-7". On side B at the bottom, it displays; "© ℗ 1993 Warner Bros. Records Inc. and WEA International Inc. All Rights Reserved". Also included at the bottom of each side of the tape are the "DIGITAL MASTER" and "DOLBY HX PRO" logos. The disc is black with white text and doesn't have the pictures of the locust at the bottom. 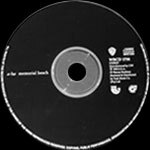 On the right hand side of the disc, it has printed that the CD was "Manufactured by CDT ℗ 1993 U.S.A © Warner Brothers and was Marketed & Distributed by Tusk Music Co. (Pty) Ltd". The "Warner Bros.", "COMPACT disc DIGITAL AUDIO", "TUSK" and "ARTONE" musical note logos are also included. Around the outer edge of the disc is some copyright text; "ALL RIGHTS OF THE RECORD PRODUCER AND OF THE OWNER OF THE WORK REPRODUCED RESERVED. COPYING, PUBLIC PERFORMANCE, BROADCASTING AND HIRING OUT DIRECTLY OR INDIRECTLY OF THIS CD IS PROHIBITED". On the back sleeve, the barcode is larger than on the European release and comes with a different number "6 001491 262223". Along the bottom it displays some similar manufacturing, distributing and copyright information which appears on the disc; "℗ 1993 U.S.A. © Warner Brothers. Marketed & Distributed by Tusk Music Co. (Pty) Ltd. All rights of the producer and of the owner of the work reproduced reserved. Unauthorised copying, hiring, lending, public performance and broadcasting of this recording prohibited". The same logos which appeared on the disc are also included. The album comes with the charcoal coloured lyric and artwork inner booklet similar to the European release, but additionally has printed on the inside back page, the same manufacturing, distributing and copyright information which appears on the back sleeve. The South African catalogue number WBCD 1758 is also displayed on the back cover. The release from Syria looks unofficial with the regular cover artwork printed in colour at the bottom of the front sleeve on a light pink background. The spine is light green and the fold-out flaps are white. The title is printed in black at the top of the front sleeve, in bright pink on the spine and fold-out flap and in bright blue on the back flap. Th titles are printed in bright blue on the fold-out flap with a pink "Sound of Asia Est" printed stamp at the bottom. This disc is made in Taiwan by UFO Group under licence from WEA International Inc. It comes with a black obi-strip with white, blue, red and pink text. The lyrics for "Between Your Mama And Yourself" are included inside the booklet. There are also two black and white text based advertising cards inside. The Taiwan cassette comes in a "UFO" plastic case. The sleeve folds out in a similar way to the European release with lyrics printed much darker to show a charcoal and white background. The usual "Warner Bros. Records Inc." production and copyright text is included, but comes with some additional manufacturing and copyright information printed in a much smaller font, it reads; "Manufactured in Taiwan under licence from WEA International Inc., ‘No licence is granted or is to be implied by the sale or supply of this cassette or container thereof under or in relation to any trademarks or copyright of or owned by WEA International Inc. anywhere in the world outside TAIWAN’". Some additional "Dolby HX" text has also been added after the lyrics for memorial beach and has been printed in both English and Taiwanese. The spine and back sleeve is dark brown rather than the usual black and comes with a white barcode. 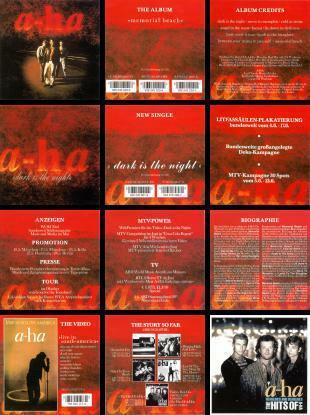 The usual track listing for each side is shown down the left and right hand sides of the back sleeve, along with the usual red production text; "Produced by David Z & A-HA". Along the bottom it displays that the cassette was "MADE BY UFO GROUP IN TAIWAN UNDER LICENSE" again in both Taiwanese and English. The spine displays the regular title "a-ha memorial beach" landscaped in the centre with the "UFO" logo shown orientated at the top and the "WB" logo, catalogue number 9 45229-4 and "Dolby HX PRO B NR" symbol at the bottom. 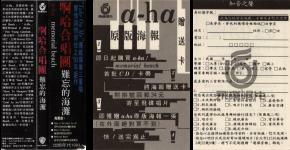 A one sided information card (similar to the "a-ha" one which comes with the CD) with information about the band is also included. The cassette is black with black stickered labels and white text. The title A-HA / MEMORIAL BEACH is shown at the top with the track listing to each side underneath. The "WB" logo, catalogue number 4-45229 and "Dolby HX PRO B NR" symbol are displayed on the left with side 1 or 2 and the "UFO" logo on the right. Along the bottom, the same English/Taiwanese manufacturing text; "MADE BY UFO GROUP IN TAIWAN UNDER LICENSE" which appears on the back sleeve has been included on both sides. Additionally, the "UFO" logo has been engraved onto the clear plastic in-between the cogs, plus the text; "UFO GROUP" has also been engraved into the top left hand corner on both sides of the tape. The cassette release comes with several variations of the stickers on the front of the cassette case. One copy includes a white sticker with the "WARNER MUSIC INTERNATIONAL" text shown in black and displaying the plain blue company logo. A second copy comes with a "MGA Records Co Ltd / Warner Music International" black and white sticker, whilst another "MGA Records Co Ltd" edition is light blue, rather than the previously black and comes with a different layout and design. The cassette itself appears to be manufactured in the US and used for the Thailand market; it comes with virtually the same folded insert as the US release displaying the full track lyrics on one side and artworks on the other, but comes with a larger white barcode on the back sleeve. On the inside of the insert, the regular "Warner Bros. Records Inc." production and copyright information is shown, but the text "made in U.S.A" has been omitted, leaving just a gap in-between. The cassette is transparent/grey with silver text, which is in slightly larger font than the US release and with a different layout. The title "A-HA/MEMORIAL BEACH" is displayed at the top with the track listing to each side shown underneath. Side 1 or 2 is included on the left hand side, with the "WB Records" logo, catalogue number 45229-4 and "Dolby NX PRO" symbol on the right. Along the bottom of side 1, it displays; "℗ © 1993 WEA International Inc", with some copyright text shown instead along the bottom of side 2; "All rights reserved. Unauthorized duplication, public performance and broadcasting of this recording is forbidden". The cassette comes in a frosted back case with the "Warner Music Europe" logo engraved into the plastic. The Turkish cassette comes with the same front cover and spine as the European release apart from the catalogue number at the top of the spine is displayed differently and doesn’t include the Ⓤ symbol or French "WE 491" number. The "WB" logo at the bottom of the spine has also been printed slightly larger. The back sleeve is also black with white text but is shorter compared to the European release, the layout is different and doesn’t include a barcode. The track listing for side 1 is displayed down the left hand side, with the track listing for side 2 shown down the right hand side. In the centre, the regular red text; "Produced by David Z & A-HA" is instead printed along the top, with some Record Company Production and Copyright information shown underneath in white; "© ℗ 1993 Warner Bros. Records Inc. for the U.S. and WEA International Inc. for the world outside of the U.S. WEA International Inc. lisansi ile MMY Ltd. Tarafindan yayinlanmistir". There is also a Turkish Record Company contact address:- "MMY MILLETLERARASI MUZIK YAYINLARI LTD. IMC. 6. Blok • 6437 Tel: 522 7585 Unkapani-ISTANBUL". Along the bottom is the usual "Warner Bros. Records Inc." contact address in the US which reads; "Warner Bros. Records Inc., 3300 Warner Blvd., Burbank, CA 91505-4694. 75 Rockefeller Plaza, New York, NY 10019-6908". The inside of the insert folds-out to include the full track lyrics and regular artwork pictures. The tape is clear transparent with a grey centre piece and comes with a different layout compared to the European edition. The title "a-ha memorial beach" is displayed at the top left hand side in large lettering. There is a small light blue rectangular sticker at the top right hand corner of side 1 displaying "KTB GK 96571 V" in gold/black text. On the left hand side we have the "WB" logo and some production text "℗ 1991 WEA International Inc.", whilst on the right hand side there is some Turkish all rights reserved trademark text; "Her hakki mahfuzdur. T.M." At the bottom of the tape there is some Catalogue numbered coding which reads; "IB 93 • 34 • U • 024 • 9362-45229-4", the same Record Company name "MMY MILLETLERARASI MUZIK YAYINLARI" which appeared on the back cover is also additionally shown. There is an Ukrainian CD edition of "Memorial Beach" which was manufactured by "Odyssey". It is similar to the European release and comes with the regular front cover artworks. There is a small blue and yellow text box at the bottom right hand corner on the front sleeve showing "зроблено в украiнi" which translates to "Made in Ukraine". There is also some additional manufacturing text printed in white and displayed in Russian at the bottom of the back sleeve; "© ℗ 1993 Warner Bros. Records Inc., a Time Warner Company. ℗ 2008 Компания Одиссей - лицензиат Warner Music International на территории Украиньі. Все права защищены. Незаконное копирование, тиражирование, сдача в прокат и любое публичное использование запрещено и преследуется законом об авторских правах. По вопросам лицензирования обращаться email: [email protected] эксклюзивные права на распространение принадлежат компании «ОДиссей»: 65012, г. Одесса, ул. Осипова, 48, тел. +38(048) 728-98-86, 760-11-15. A-HA / MEMORIAL BEACH 1 аудио-сd. Качество гарантировано, 6 месяцев от даты приобретения Хранить при t: -10°/+30°C. не подлежит обязательной сертификации. Подробная информация на сайтах: www.odyssey.od.ua и www.planetahitov.com". The back sleeve also comes with a white barcode in the top right hand corner, but the number "4 823022 800016" is different compared to the European release. The catalogue number 9362-45229-2 WE 833 is also shown underneath. Some copies come with an additional "Moon Records" white sticker on the back of the CD case covering up the Barcode and Catalogue number, instead displaying some contact details and website addresses; "MOON Records тел. 594-06-62 [email protected]". The title; "A-HA дльбом MEMORIAL BEACH", "Moon Records" symbol and different barcode number "2 000000 526662" is also shown. Also printed and displayed on the back sleeve is the "Warner Brothers 50 Records" and "COMPACT disc DIGITAL AUDIO" logos, along with two additional rectangular "ODYSSEY" snake and round globe "PLANET OF HITS www.planetahitov.com" logos. A silver rectangular control mark "контрольна марка" hologram sticker is also included. The disc itself is the usual black with white printed text and comes with the picture of the locust at the bottom. The "ODYSSEY" and "PLANET OF HITS www.planetahitov.com" logos are again displayed additionally on the right hand side of the disc, along with some Russian manufacturing information; "© ℗ 1993 Warner Bros. Records Inc., a Time Warner Company. ℗ 2008 компания одиссей – лищензиат Warner Music International на территории украины. все права защищены. Незаконное копирование, тиражирование, сдача в прокат и любое публичное использование запрещено и преследуется законом об авторских правах. отпечатано в украине. www.odyssey.od.ua www.planetahitov.com". Around the outer edge of the disc is some additional Copyright text printed in English, German and French which reads; "ALL RIGHTS OF THE PRODUCER AND OF THE OWNER OF THE WORK REPRODUCED RESERVED. UNAUTHORIZED COPYING, HIRING, LENDIND, PUBLIC PERFORMANCE AND BROADCASTING OF THIS RECORD PROHIBITED. ALLE URHEBER- UNDLEISTUNGSSCHUTZRECHTE VORBEHAL TEN. KEIN VERLEIN! KEINE UNERLAUBTE VERVIELFALTIGUNG, VERMIETUNG, AUFFUHRUNG, SENDUNG! . TOUS DROITS DU PRODUCTEUR PHONOGRAPHIQUE ET DU PROPRIETAIRE DE L’OEUVRE ENREGISTREE RESERVES, SAUF AUTORISATION, LA DUBLICATION, LA LOCATION, LE PRET, L’UTILISATION DE CE DISQUE POUR EXECUTION PUBLIQUE ET RADIODIFFUSION SONT INTERDITS!". The actual insert booklet included is the same as the European second pressing and comes with the darker charcoal coloured artwork. The Catalogue number 9362-45229-2 is as usual displayed on the back cover. The release from Uruguay looks unofficial but comes with the regular European front cover artworks. The back sleeve is black with white text and doesn't include a barcode, leaving just a blank space. The track listing for side 1 is displayed down the left hand side, with side 2 being down the right hand side. Along the bottom there is some Spanish manufacturing information; "FONOGRAMA ES CULTURA. PRODUCTOR FONOGRAFICO W.E.L.S.A. Made in Uruguay - Art. 79 - Ley 13.349 - Imp. FIMASA D.L." 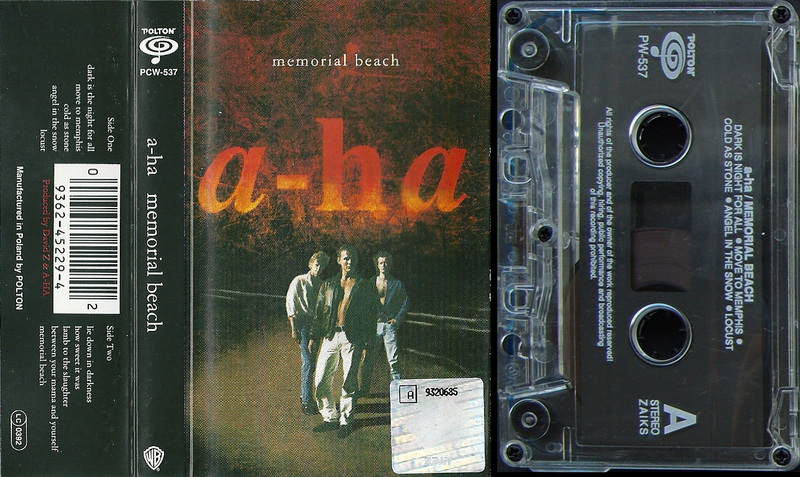 The Spine also black with white text; displays the title "a-ha memorial beach" landscaped in the centre with the "WB Records" logo shown orientated at the top and the "Dolby B NR" symbol and catalogue number 20095-4 at the bottom. The release also comes with the usual fold-out insert displaying the full track lyrics in black on a grey and white background on one side, whilst on the other, it includes the regular black and white group shot, glowing red and yellow locust and the black and white picture of the woman lying on a bed with the track listing in white shown above. On the lyric side, the usual "Warner Bros. Records Inc." production and copyright information is included, but the text "made in U.S.A." has been blacked out. The tape is white with a white stickered label and black and blue text. The title A-HA "MEMORIAL BEACH" with the track listing to each side underneath is displayed at the top in black. On the left hand side again shown in black is the catalogue number 20095-4 and "(P) 1993". At the bottom left hand corner shown this time in blue is the "AGADU" and "WB Records" logos with side 1/2, "STEREO" logo and "Dolby B NR" symbol on the right. There is some Spanish copyright and "Dolby" information displayed in blue along the bottom of each side; "Reservados todos los derechos del productor fonografico y de los autores de las obras registradas en esta cinta prohibida su reproduccion, ejecucion publica y/o radio-teledifusion. Industria Uruguaya (Made in Uruguay) "Dolby" y el simbolo doble-D son marcas registradas de Dolby Laboratories Licensing Corporation. Bajo licencia RCA. Productor Fonografico WEL S.A. Fonograma es Cultura". The U.S. CD edition is similar to the EU release and comes with the same front cover sleeve. The disc is black with white text and includes the locust at the bottom, it comes with some amended manufacturing information; "© ℗ 1993 Warner Bros. Records Inc., a Time Warner Company. Made in the U.S.A. Mfg. by WEA Manufacturing" printed on the disc but excludes the GEMA/BIEM and the LC 0392 coding information. There is also no Copyright text printed around the outer rim of the disc. On the back sleeve there is no catalogue number shown under the barcode in the top right hand corner, plus the manufacturing and copyright information along the bottom has been slightly changed to; "Warner Bros. Records Inc., a Time Warner Company. 3300 Warner Blvd., Burbank, CA 91505-4694. 75 Rockefeller Plaza, New York, NY 10019-6908. © ℗ 1993 Warner Bros. Records Inc. for the U.S. and WEA International Inc. for the world outside of the U.S. Made in U.S.A. All Rights Reserved. Unauthorized duplication is a violation of applicable law". The booklet is the same as the European release including the charcoal coloured artwork but the back sleeve comes instead with the US catalogue number 9 45229-2 shown and "Made in USA" text on the inside credits page. The standard U.S. cassette is similar to the European release and comes with the regular fold-out insert displaying the front cover artworks. The catalogue number at the top of the spine has been changed to 9 45229-4 and is displayed in red instead of the usual white, There is also an additional "Dolby HX PRO B NR" symbol included, along with the regular "WB" logo shown at the bottom. The title "a-ha memorial beach" is printed and displayed landscaped as usual in the centre. On the back sleeve, the white barcode is smaller than on the European edition and doesn't include the Made in German manufacturing information. The "Warner Bros. Records Inc., 3300 Warner Blvd., Burbank, CA 91505-4694. 75 Rockefeller Plaza, New York 10019-6908." contact address has been printed instead along the bottom. The inside of the insert displays the full track lyrics on one side and the regular artworks on the other. At the bottom right hand corner of the lyric side, the usual "Warner Bros. Records Inc." Production and Copyright information is displayed but additionally shows that the cassette was "Made in U.S.A.". There is also some "Dolby" text which reads; "Dolby, the double-D symbol and HX PRO are trademarks of Dolby Laboratories Licensing Corporation". The catalogue number 9 45229-4 is also included. 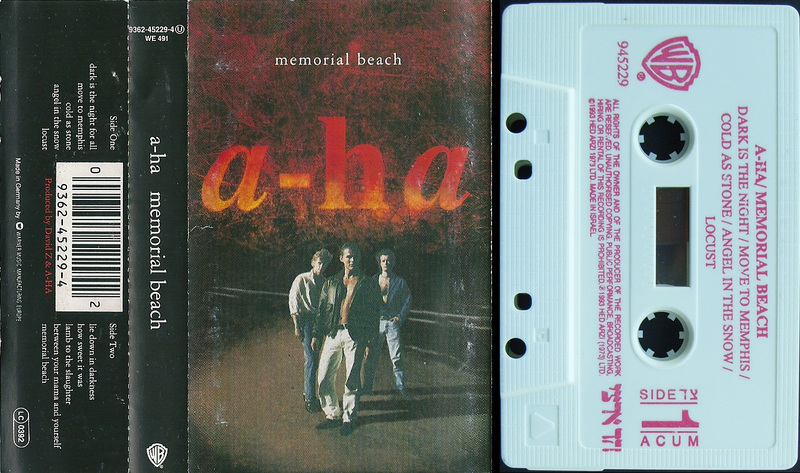 The actual tape like the European release is transparent/grey with white text, it displays the title "A-HA/MEMORIAL BEACH" at the top with the track listing to each side underneath. The "WB" logo and catalogue number 4-45229 is shown on the left hand side with side 1 or 2 and "SR" on the right hand side. The "Dolby HX PRO B NR" symbol is included at the bottom right hand corner. Along the bottom of each side, there is some different Production information. On side 1, it shows; "PRODUCED BY DAVID Z & A-HA" whilst on side 2 it's credited instead to the record company; "℗ Warner Bros. Records Inc., a Time Warner Company. Made in U.S.A.". There is a U.S. promo cassette which comes in a clear plastic case with the "Warner Music" logo inscribed on the back. It comes with a white folded cardboard insert with black printed text. The front sleeve includes the title; A-HA "MEMORIAL BEACH" printed landscaped along the top with the "WB RECORDS" logo in the top left hand corner. The full track listing to each side, Catalogue number 4-45229 and text; "NON DOLBY/FROM DAT" is shown underneath. On the spine, the title is again printed landscaped in the centre, with the "WB RECORDS" logo on the left and a Californian address and telephone number included underneath; "3300 Warner Blvd, Burbank, California 91510 (818) 846-9090". The title is again shown on the back sleeve, along with the release date; 05/12/93, (CASSETTE) and "IHS/JM" text. 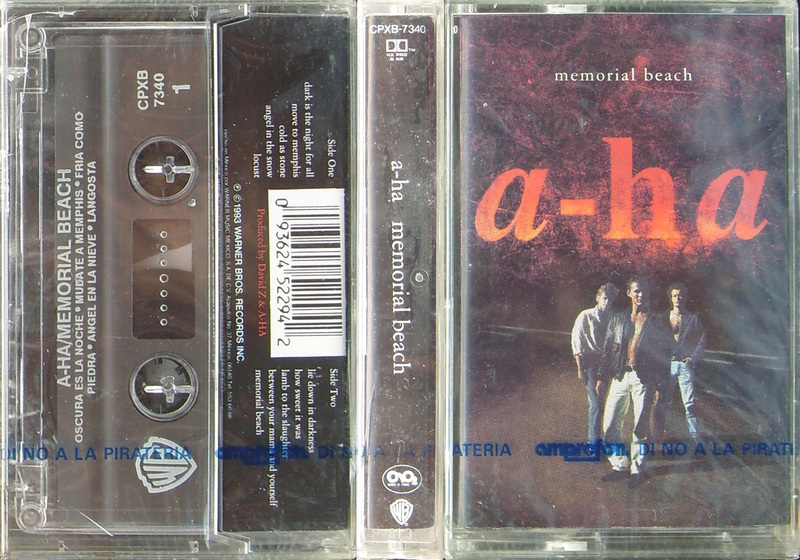 The tape itself is transparent with a grey and white strip along the top on which the title A-HA "MEMORIAL BEACH" is printed. The Venezuela cassette was distributed by "SONOGRAFICA" and comes with the usual front cover artworks. The release doesn’t include the regular fold-out insert showing the track lyrics and artwork pictures. The inside of the insert is cream with black text, and has the tracks listed in both English and Spanish, with an incorrect spelling of a-ha as a-ah at the top. On the inside of the back sleeve, it includes some "Wind the tape to the end before turning over" and Spanish copyright text; "PARA EVITAR EL ESPACIO EN BLANCO. FAVOR ADELANTAR LA CINTA ANTES DE CAMBIAR AL OTRO LADO". "Prohibida la reproduccion locacion (alquiler) y prestamo de este ejemplar y su radiodifusion o ejecucion publica. Reservados todos los derechos de los autores de las obras y del productor de fonogramas". The outer back sleeve and spine is black with white text and comes without a barcode. There is some Spanish manufacturing and distributing information printed along the bottom of the back sleeve; "P y C 1993 WEA INT’L INC. Hecho y distribuido en Venezuela por DISTRIBUIDORA SONOGRAFICA C.A. Bajo licencia de WEA INT’L. INC. Deposito Legal: FC 11093421". 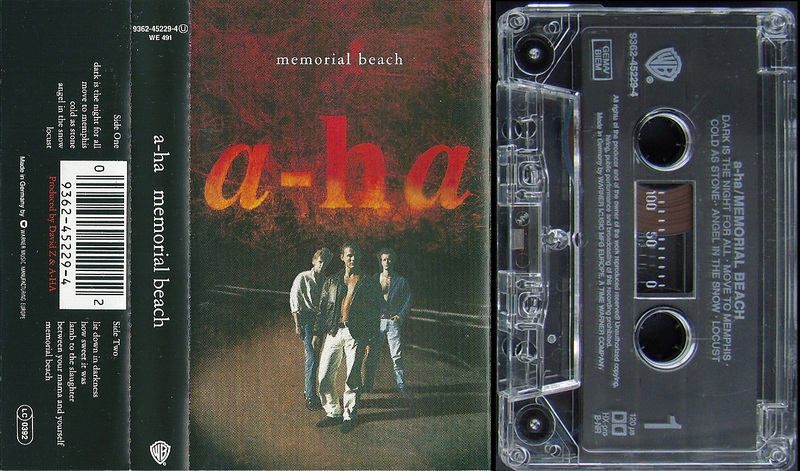 On the spine, the title "a-ha memorial beach" is displayed landscaped but in a smaller font than the European release, the Catalogue number 245.229-4 with the "WB" logo is displayed orientated at the top, with another number 35.050-C and the "SONOGRAFICA" logo printed on a white background shown landscaped at the bottom. 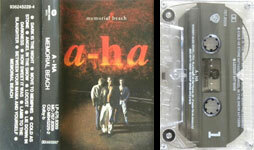 The cassette is black with gold text and displays the title "a-ha memorial beach" with the track listing to each side underneath. On the right hand side, it includes the "WB" logo and side A or B. Along the bottom of both sides; it shows the "SONOGRAFICA" logo with reference number 35.050-C and "DOLBY HX-PRO" symbol. Additionally engraved into the plastic at the top of the tape on each side is the text; "Hecho en Venezuela" (Made in Venezuela).